Growth Habit: An erect plant with branching stems. It can grow to a height of 1m but usually 70cm. The warts on the leaves during immature stages distinguish it from close relatives such as charlock and wild radish. In the mature stage the stem clasping leaves help with identification. Type of Plant: Wild Turnip is an annual, which forms a rosette in its early stages. Flowers: The flowers occur in clusters at the top of the stalks. They are bright yellow with 4 petals averaging 15mm in diameter. Fruit/Seed: A long flattened pod with several small, oval seeds within. Dispersal: Main germination occurs in autumn and spring, however germination will also occur in summer given adequate moisture. Distribution: Widespread throughout Tasmania. 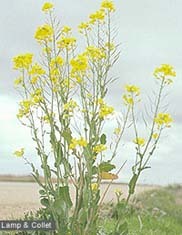 It is a major weed in all arable crops, roadsides and waste areas. Wild Turnip competes strongly with arable crops and can overwhelm young and low growing crops. It is capable of causing substantial crop losses. For further information contact the Department of Primary Industry, Water and Environment, Tasmania. Herbicide. For roadsides, waste areas and pastures, herbicides registered for use include glyphosate, MCPA and dicamba. Contact DPIWE for specific recommendations for in-crop use.